Elegant Curtains overlooking Key Biscayne! 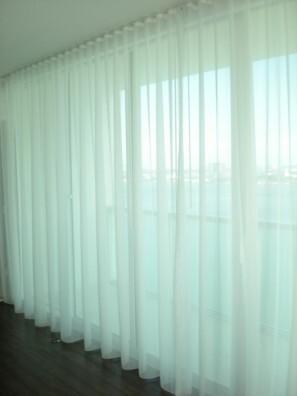 Soften up your beautiful Miami view with some custom sheer curtains! Filter bright sunlight, while creating a subtle finishing element to the design of your home! The style is called “ripple fold”, which offers a more contemporary drapery look. This style of curtains is one of Brown Design’s specialties! Please visit our Custom Curtain Gallery for examples of our completed installations and ideas on how you can create a design for your home or office. Call us today (305) 342-2360 for your free on-site estimate or EMAIL US!